If you’re looking for an online software developer that offers a selection of vibrant keno variants, look no further than 1X2 Gaming. This game studio offers more unique keno titles than any other game developer – we explain more about the 1X2 brand and where you can play these fun keno games for real money bets online using AUD. 1X2gaming is a developer of online casino games located in the UK area of Brighton and Hove. The company has been in operation since 2003, firmly establishing itself as a leading provider of online virtual sports, pokies, table games, scratch cards and number games like bingo and keno. While the brands major offering comes from virtual betting and classic casino games like roulette, poker, blackjack and the pokies, 1X2gaming offers a handful of keno games with a twist, making it a clear front-runner when it comes to real money online keno. 1X2gaming specialises in HTML5 and Flash based software, which means their keno games are available for instant-play directly over your Web browser without having to download any software. All games use certified RNG (random number generated) software and are licensed by several of the world’s most revered online gambling jurisdictions, including the Malta Gaming Authority and the Alderney Gambling Control Commission. What 1X2gaming keno games are available? While we’re lucky if leading online software developers like NetEnt, Microgaming or Playtech offer even a single keno variant, 1X2gaming rules the roost by offering a total of six different keno titles. The games range from the basic to the obscure, but each use impressive software and are presented in an eye-catching manner with attractive graphics and a user-friendly format. Keno – A classic take on traditional keno with no particular bells or whistles, but offering a colourful grid with a turbo-play and random pick function, as well as a game history that shows previous results and past bets. 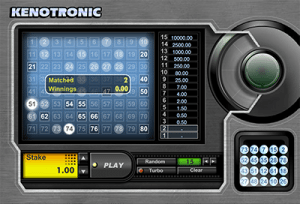 Kenotronic – With minimum bets starting from just $0.05, Kenotronic offers a new-age version of keno where the standard format is used, but things look super slick and sophisticated. Offering a typical grid of 80 numbers, players can make up to 15 keno picks for the chance to win a jackpot of 10,000X the size of the current bet. Play with your speakers on to enjoy the cheesy cyber-inspired soundtrack. Kenolab – Kenolab offers a science themed take on the classic keno format, where players can choose up to 15 numbers from one to 80 for the chance to win a payout of up to 10,000 times your active wager. 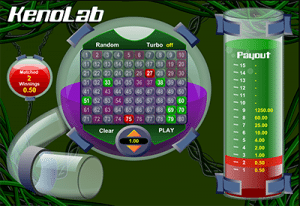 Kenolab offers both an auto-pick and a turbo-play feature for some of the fastest keno games going around. Do you have the winning formula? Super Keno – Super Keno is perhaps the most visually impressive version of keno you’ll find on the Internet. While the format is traditional, there’s something about this game that looks superior. Instead of waiting for the balls to be drawn out of a pit, the winning numbers shoot out from the bottom of the screen to smash onto the grid, with explosions of victory for every successful pick. Super Keno will appeal to younger players who view keno as slow paced, as this game is anything but. Keno Kick Off – Talk about an innovative keno game! Keno Kick Off has been customised to appeal to soccer fans, with the keno grid of only 40 numbers set against a green soccer field as crowds cheer on the sidelines. Instead of balls being sucked out of a pit, soccer balls fall down from the sky to land on the grid as players run onto the field to prepare for the game. 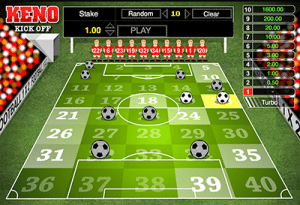 You don’t have to be a football fan to love Keno Kick Off – this is a light-hearted, fun game to appeal to all players. Jackpot Keno – Jackpot Keno offers traditional game play, with a grid numbered one to 80 where players can pick up to 20 numbers. There’s not really anything to separate Jackpot Keno from 1×2’s classic Keno title, other than a difference in the use of colour and design, but it’s still a great game for players looking for a safe online keno game. 1X2gaming keno titles can be found at one of our top-rated online keno sites, Emu Casino. Not only does Emu offer an easy instant-play format, it also offers the chance to try these games for free in practice mode so you can sample all the different keno titles before committing to any real money bets. Emu Casino warmly welcomes Aussie players, accepting deposits in AUD using trusted payment methods like Visa, MasterCard, Netller, Skrill, Paysafecard, Flexepin and direct bank transfers. Protected by 128 Bit SSL (Secure Socket Layer) digital encryption security and licensed by the Government of Curacao, Emu Casino offers a safe and reputable place for Australian punters to play keno on the Web for real money bets from the comfort of home. Keen to give these 1X2Gaming keno variants a go? Sign up for an account at Emu Casino to get a free $3 no deposit bonus simply for registering, followed by up to $300 in matched deposit welcome bonuses when depositing real money for the first time.